If you will ask me what is my first impression about two very busy days on the Island of Usedom, my answer is: quiet, too quiet. In fact, it is the first place at sea I ever been too where tourists are so quiet. And I was right. A friend of mine from Berlin told me that each time when she wants to relax, she goes to Usedom. Many Berliners are doing the same, as the island is considered as the favourite and cheapest sea destinations for the citizens of the capital city. As everywhere in Germany, there are different prices for different budgets and everyone will be happy to find a good place to stay or to eat. All will finally meet at the beach - where they need to pay a little bit for the chairs, but sitting on the sand is for free. My first destination was the city of Usedom. From the train station of Heringdorf - the village of the Hering, nowadays the address for many elegant villas - I took a bus to the city. The bus stop is located at the train station and the buses are regular. My first cultural shock by arrival was the German spoken by the driver. At the first sight, it sounded as Polish, Slovakian or any other language except German. As I was explained later, I was exposed to the sound of the Pommersche dialect, but till the end of my trip, it reminded a very foreign language to me. My first stop was at the Usedom city. I booked a stay there without being aware that it is nothing exciting to see there. If you are looking for nothing else than eating and resting and eventually walking or hiking - bikes can be rented from many centers on the island - it is the right place to go. There are several restaurants and biergartens and even some supermarkets but all of them are closed after 8pm. 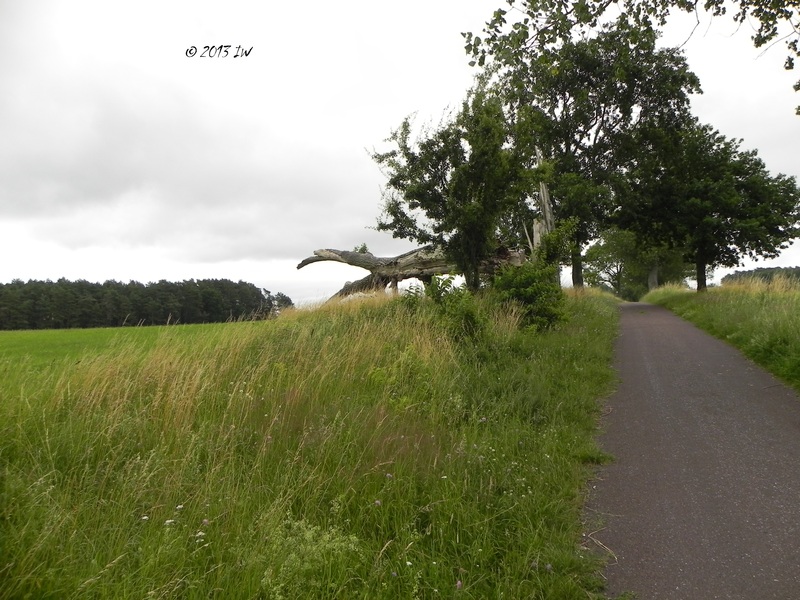 When I returned from a long 4+km walk to the Stolpe castle it was past 8 and was very hungry but did not find anything decent so I had to go to sleep hungry and the first thing in the morning to run to the beach area - almost one hour away. The walk in the nature - except some minutes when I was afraid that I storm will ignite and I was not in the mood for such an extreme experience - was one of the best in years and somehow: quiet landscape, borderless green lines and horses. Stolpe looked almost empty, even though it was mid-July, the usual high season for Berliners and other German tourists with houses in the area. The castle, recently renovated, is hosting various painting classes, classical concerts and lectures. I have no idea how many people are running to such events, but probably it have to be a public somewhere. The next day, hungry and tired after the long walk and the rush of the travel the day before, I left Usedom city without regrets, looking for more entertainment and for the real life of the island. I returned to Heringsdorf, that can be translated as the 'village of the Hering', a reminder of the fishermen's background of most urban areas on Usedom. It looks typical as a seaside location for the middle-class. together with Ahlbeck and Bansin, it is part of the 3 'Kaiserbaeder', sharing a common architecture, specific for such localities. The only source of revenue for the area is tourism and there are a lot of opportunities for a variety of budgets: big and elegant hotels with exclusive spas, restaurants, jewellery and outlet shops, but also parks for children, small restaurants and bars. I booked a tour by minicar that brought me around the three localities while listening (in German) to a recorded presentation of the area, with history, details about architecture and the daily life. The place was visited by many personalities, especially from the literary world, and their presence is reminded with commemorative marks. Tourism developed in the 19th century and developed mostly in the direction of health and wellness, with a sanatorium and many treatment places that are still used today. The Russian writer Maxim Gorki and his family was here in 1922, and a book store in Heringsdorf bears his name. During the Cold War, Usedom was the favourite destination of many members of the communist and Soviet elite stationed in the DDR. Nowadays, it is called 'Berlin Badewanne' as it is the closest and the most affordable sea destination from Berlin and often I hear about friends going there for the weekend. It is not cheap, but affordable, especially if you book your stay weeks or even months in advance, as always in Germany. 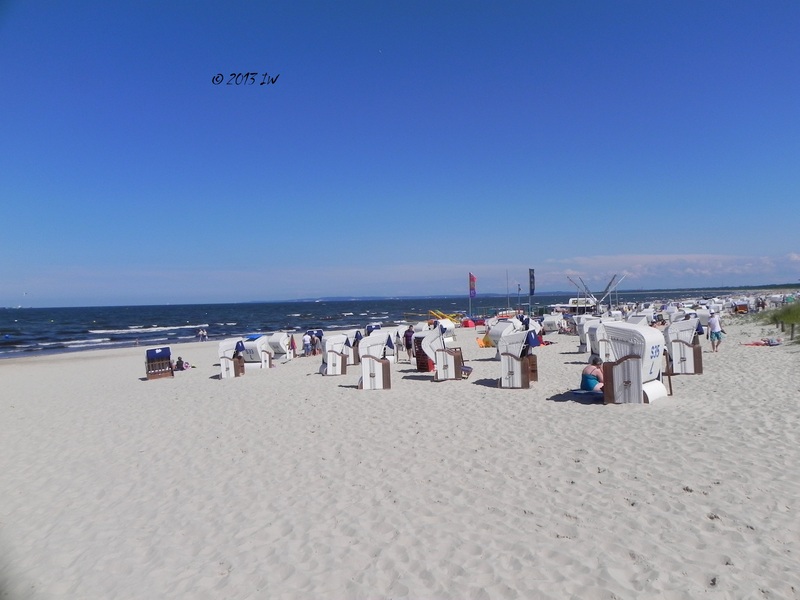 I liked the quiet ambiance - not that quiet as in Usedom, but pretty silent compared to the usual busy life of a beach area. You can walk and see Poland on the other side of the sea and there it is possible to book a sea trip for a couple of hours to visit Poland too - Wolin and Swinoujscie. Most street names and restaurant menus are also written in Polish, but most tourists I've seen on the street were speaking German. Ahlbeck beach during the high season. Fine sand and clear sky, what else can you wish? Many more C. degrees. What I was unpleasantly surprised was the low temperature, including for the water. The hottest temperature goes around 25C so don't be afraid to get sunburned. Don't expect nothing extreme or out of normal while in Usedom: enjoy your time, go to a spa and a massage, take a trip around, have a good meal (fish is the predominant dish of many restaurants) and come back to Berlin after 2 days.